Gathering recently were, from left, James F. Gaertner, SHSU president; faculty excellence winners Valerie Muehsam, Sam Souryal and Bala Maniam, and David Payne, vice president for academic affairs. The accomplishments of this year's Sam Houston State University faculty excellence award winners in research and service have a distinct international flavor, and students are especially happy that SHSU serves Dr. Pepper in the classroom. 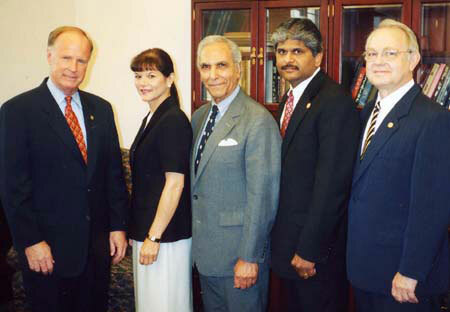 The 2003 faculty excellence winners are Valerie "Pepper" Muehsam, Excellence in Teaching; Bala Maniam, Excellence in Research; and Sam Souryal, Excellence in Service. Muehsam, who has been a finalist for the Excellence in Teaching Award three times in the past four years, is an associate professor in the Department of Economics and International Business. 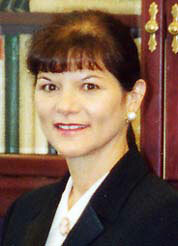 She earned bachelor's (1988) and master's (1991) degrees from SHSU and her doctorate from Texas A&M University in 1998. She has worked previously as an accountant for the Candyce F. Dixon accounting firm in Huntsville, as administrator for the Family Practice and Surgery Clinic in Huntsville, and began her teaching career at SHSU in January 1992. Among her colleagues in the College of Business Administration Muehsam is known for high averages on teacher evaluation forms, where a "7" is the highest possible rating, and by the students for her enthusiasm and extra effort. "I know it seems unlikely for a student to give a professor all 7's and a perfect score," one student wrote on an evaluation form, "but Dr. Muehsam honestly deserves it. I've never had a professor that was so AWESOME. I wish she taught every class. Dr. Pepper thank you for your help in everything and your patience." "She is always willing and available if you have a question," wrote another. "I thought that the fact that she held test study sessions on Sundays was really great." A colleague who wrote a letter supporting Muehsam's nomination said that "I have not been able to determine when (if ever) her office hours end. Current students, former students, and even students that have never enrolled in one of her classes, are always seeking her out for help and advice." "Valerie is now the standard by which I judge all teachers," wrote another. "She has the unique ability to be professional, demanding, caring, compassionate, and motivational. In a phrase Dr. Muehsam epitomizes the ideal educator." 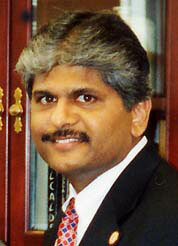 Excellence in Research winner Maniam is an associate professor in the Department of General Business and Finance. He earned his bachelor's (1986) and master's (1987) degrees from Arkansas State University and his doctorate from the University of Mississippi in 1992. Prior to his academic career he was an administrative clerk in the Standard Chartered Bank in Malaysia. Before coming to Sam Houston State in July 1997, he was a teacher, researcher and administrator at Arkansas State, the University of Mississippi, and Texas A&M International University. At A&M International his teaching evaluations were among the highest in the College of Business Administration, and he received the college's Best Scholar of the Year Award for 1996-1997 for overall excellence in teaching, research and service. "Over the last 14 years, Dr. Maniam has produced over 160 peer-reviewed publications," one colleague wrote in a letter supporting his nomination for the award. "His research has appeared in 48 journal articles, 113 conference papers and a book chapter." Another commented that Maniam's research field of international finance is especially relevant in today's international political and business climate. "His topics have ranged from financial issues in Mexico, Asia, the European Union, Mercosur, Malaysia, and Argentina," he wrote. "His international repute is evidenced by the number of invitations he receives to speak throughout the world." His other awards, honors and service include the Distinguished Teacher Award for Innovative and Creative Teaching by The Academy of Educational Leadership. He has served as president, president-elect and past president of the Southwest Decision Science Institute, as editor of the Journal of International Business Research and Proceedings of the Southwest Decision Science Institute, as associate editor of The Journal of Finance Case Research, and guest editor for two journals. Excellence in Service winner Souryal, professor in the College of Criminal Justice, is known as well for his international accomplishments. This includes service to the United Nations, but he has also become well known in the United States in the field of law enforcement ethics. His educational background includes a bachelor's degree from the American University in Cairo, Egypt, master's or equivalent degrees from the United Nations Institute of Public Administration, Higher Institute of Police Sciences in Cairo and State University of New York, and doctorate from the University of Utah. He began his academic career at Russell Sage College in 1968 and also taught at the University of Utah, Westminster College, the Utah State Penitentiary and the University of Wisconsin-Oshkosh before coming to Sam Houston State in 1973. One colleague wrote in nominating Souryal for the award that his assignment as representative of the High Commission of Human Rights in Indonesia for the United Nations in 1999 went above and beyond the call of most service duties. "He accepted great risks in going to a country in turmoil in order to help educate the leaders and the people about democracy," he wrote. "In this capacity he also helped to establish the mechanism for the first democratic election this country has seen in many years. It should be kept in mind that he literally put his life on the line for democracy." The colleague also wrote that "his name is synonymous with 'ethics' in law enforcement in this country." Souryal speaks often and has written numerous articles in that area, serves as consultant to police departments throughout the United States, and is a consultant for the Anti-Terrorism Division of the U. S. Department of State. In 2002 he was invited by the Belgian Parliament to advise the government on new methods to counteract hate crime. That year he was also selected as a representative to the Sharia consortium meeting of seven Middle East countries. 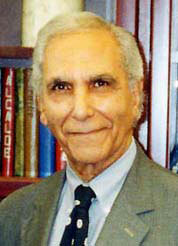 Souryal was also awarded the SHSU Excellence in Research Award in 1990. The three excellence award recipients will be recognized during the university's spring commencement exercises May 17. The awards also carry monetary stipends of $1,400 for Excellence in Teaching, $1,200 for Excellence in Research, and $1,000 for Excellence in Service.